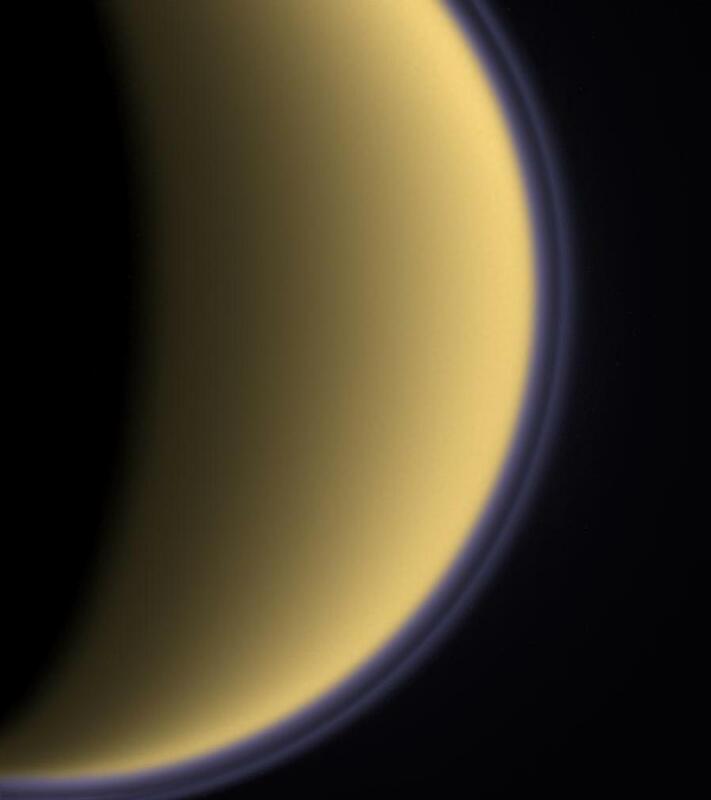 The image above, obtained during the Cassini mission in the Saturn System which started in 2004 and which ended in 2017, reveals a portion of Titan's atmosphere which appears completely opaque from outer space in the visible spectrum. One can notice, in particular, the detached haze layer evolving in the upper atmosphere of Saturn's largest moon. That thin layer appears purple in this colorized view and the color is close to what the human eye would see from outer space. The original image was acquired with the Narrow-Angle Camera of the Cassini orbiter on July 3, 2004, one day after the first flyby of Titan. The view was captured at a distance of approximately 789,000 kilometers or 491,000 miles from the giant moon and at a Sun-Titan-probe, or phase, angle of 114 degrees. The image was obtained on the basis of a spectral filter sensitive to wavelengths of ultraviolet radiation centered at 338 nanometers. The detached haze layer had already been identified thanks to data acquired from the famous interplanetary probes Voyager 1 and Voyager 2 at the beginning of the 1980s. 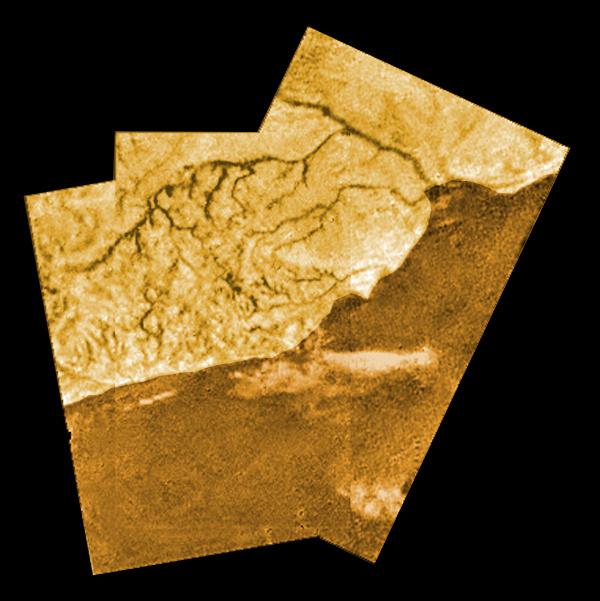 The portion of Titan's disk reveals the southern polar region. The artificial colors roughly reflect what our eyes would see from outer space with the global pale orange hue and the blue or purple detached haze layer found in the upper atmosphere. Let's note however that the haze blankets have been brightened for visibility. The detached haze layers can be clearly seen in the ultraviolet spectrum because the small particles they are made of scatter short wavelengths more efficiently than longer wavelengths such as wavelengths of the visible spectrum and wavelengths of the infrared spectrum. Photochemistry plays a key role in the upper atmosphere where a haze rich in organics or hydrocarbons is engendered under the influence of ultraviolet light from the Sun. A soup of ions, molecules or radicals involving carbon, hydrogen or nitrogen takes shape with many interactions which lead to the development of new molecules. Thus, a haze is generated in that particular environment. The soup begins at an altitude higher than 600 kilometers or 370 miles above the ground. The molecules which are heavy enough tend to go down to lower altitudes to form the main haze. The main haze is opaque enough to prevent us from discerning surface features in the visible spectrum from outer space. The detached haze layer identified from the Cassini orbiter was observed at an altitude of about 500 kilometers or 310 miles which is much higher than the detached haze layer identified from Voyager which was located in an area between 300 kilometers (185 miles) and 350 kilometers (215 miles) above the ground. Thus, the detached haze layer may have migrated upward from Voyager to Cassini or may be related to seasonal factors. There may be variations in haze production or variations in the strength of atmospheric circulation over time during a Titanian year. 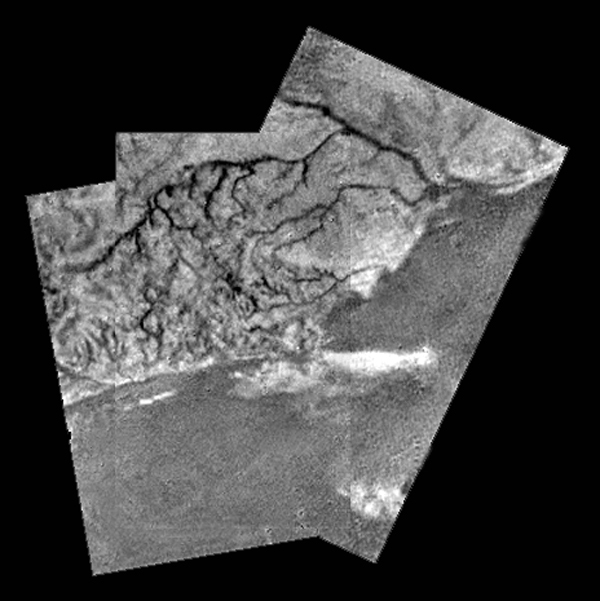 The mosaic in the upper part of this table, generated on the basis of data obtained from the Huygens probe during its atmospheric plunge performed on January 14, 2005, unveils an aerial view of Titan's surface. One can notice, in particular, a remarkable contrast between a dark plain and brigh hills composed of a network of dark channels. Does the dark plain correspond to an ancient sea ? Does the plain undergo flooding events from time to time ? The dark channels are likely drainage channels or rivers. They may be closely related to meteorology or rainfall events involving liquid methane. The mosaic in the lower part of this table represents a colorized image of the upper view. Credit for the original view: ESA/NASA/JPL/University of Arizona. Credit for the colorization of the original view: Marc Lafferre, 2019. The view above reveals a mosaic of images of Saturn's largest moon Titan in the infrared spectrum. Each disk of the Opaque Moon Titan unveils surface features thanks to the infrared eye of the Cassini spacecraft whose mission in the Saturn System started in 2004 and ended in 2017. The colors of each disk are artificial and are mainly based on data obtained from the Cassini spacecraft and from the Huygens probe during its remarkable atmospheric descent on January 14, 2005. 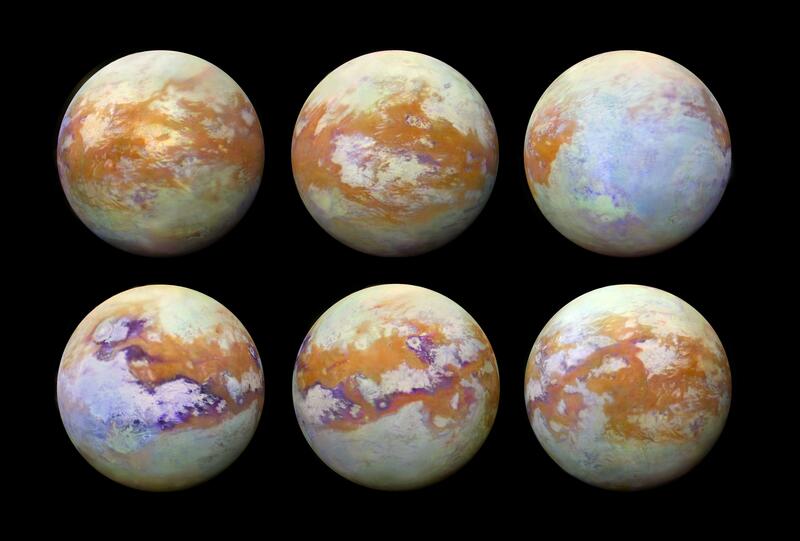 In the visible spectrum, the surface of Titan can't be discerned from outer space due to the hazy atmosphere of the giant moon but in the infrared spectrum, one can clearly see surface features and a major contrast between relatively bright areas and relatively dark areas. The dark areas in the low latitudes of the Orange Moon, which appear brown here, tend to be dominated by Seif dunes or linear and parallel dunes extending over long distances. The pools of liquids, rich in hydrocarbons, methane or ethane, are found in the high latitudes of the moon. The bluish or purple areas may reveal materials enriched in water ice. The images of Titan's disk are based on the large amount of data acquired with the Visual and Infrared Mapping Spectrometer (VIMS) of the Cassini spacecraft during its long mission in the Saturn System. These color views are based on a multitude of images or data collected from the Cassini orbiter under multiple illumination and viewing conditions. Specialists had to assemble a multitude of images in order to obtain a seamless mosaic and in order to produce a relatively realistic appearance of Titan's surface. The mosaic was first published in July 2018. Image Credit: NASA/JPL-Caltech/University of Nantes/University of Arizona. The image appearing in the upper part of this table represents a raw image of Saturn's largest moon Titan obtained on July 2, 2006 from the Cassini orbiter. The file name of the view is W00015711.jpg. The camera of the probe mobilized the CB3 and CL2 filters to acquire the raw image. The view had not been validated and calibrated at the time of the image release. A validated/calibrated view had to be archived with the Planetary Data System of NASA. The image appearing in the lower part of this table represents a colorized view of the upper view. One can notice surface features in the disk of Titan. The contrast between relatively bright areas and relatively dark areas on the Opaque Moon appears well pronounced. Credit for the original view of Titan: NASA/JPL-Caltech/Space Science Institute. 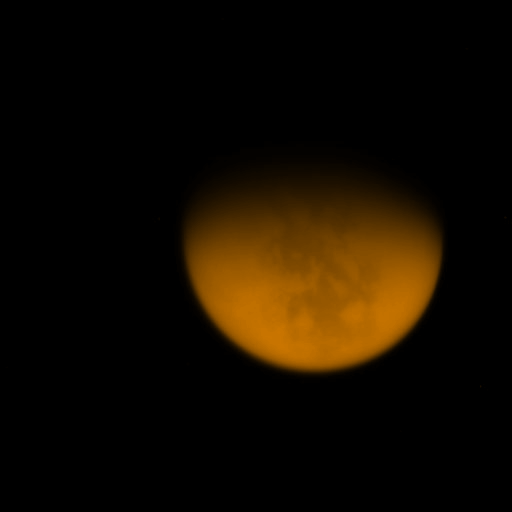 Credit for the colorization of Titan: Marc Lafferre, 2019.